COMMENTS : Think this is too old fashioned and 80s. Could be better with a lower, more relaxed neckline and a fitted silhouette. Silk would also be better, and made available in some nice vibrant colours. 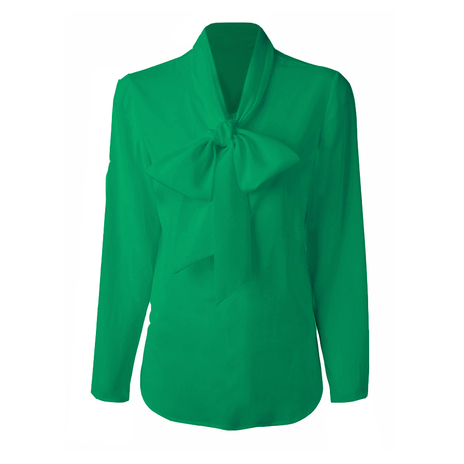 COMMENTS : I've been looking for an emerald green blouse- love it! Green is on trend this year according to Harpers Bazaar and Vogue. COMMENTS : Just love the colour of this. Silk would be best for this blouse as it would drape perfectly. COMMENTS : Don't like colour and too frumpy. COMMENTS : I like the colour, but not the bow on the front. It's too big and won't show your natural bust shape. a little old-fashioned. COMMENTS : This green is beautiful. I'm not overly keen on the large bow. Maybe a small ruffle or just a collar instead? A material that drapes would be lovely. Like the arm length. COMMENTS : I am not keen on the colour and the bow is over large for a small frame, sorry Jeetly. COMMENTS : I love the design and colour. In silk would be just lovely, particularly if it was machine wash on the silk cycle. COMMENTS : As with the pink version, this colour is not to my taste but I like the design, particularly the bow as it would accentuate a smaller bust. The long sleeves and modest neckline are also perfect for those who prefer to be a little more covered up. COMMENTS : Colour is lovely although could be a bit darker. The bow does make it look a bit frumpy as previous reviewers comment but I would leave untied for a more modern look.